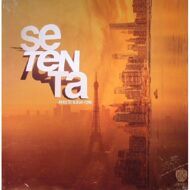 Created in 2006, SETENTA, the Latin Soul Band from Paris, spreads a unique mix over the world scene. After a sparkling debut with their first albums Funky Tumbao (Hot Casa Records / Fat Beats 2010), then followed in 2013 by Latin Piece of Soul (Hot Casa Records), and after successful live experiences and strong links developed with New-York, the French seven-pieces combo is back with a modern definition of Latin music. Following their outstanding live collaboration at "Théâtre Les Etoiles" in Paris, and "Jazz Mix de Vienne" in June 2015, they invite Joe BATAAN, the Latin soul legend, to record "My Rainbow", a rare bolero, soulful, with spiritual lyrics written by the godfather, maybe a new classic ballad for the history. Composed collectively, this album mixes up Latin, Soul, Hip-Hop, Funk, modern Jazz, or Psychedelic Boogaloo, with a percussive and strong vocal section, sung in Spanish, English, Creole, Yoruba and French, for the first time in their repertoire, with the song "Madame Shingaling". SETENTA spreads love, peace and positive energy all over the world, from Paris to Nueva York.